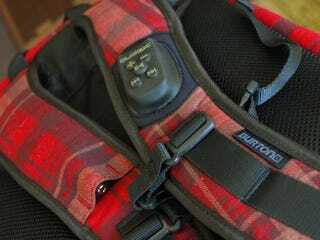 The Gadget: This Lumberjack Red backpack from Burton features a wireless Audex control system for your iPod while providing space for a laptop and whatever random gear you can cram in it. The Verdict: The wireless Audex system which controls your iPod works like any other iPod RF remote. There's an RF receiver dock adapter and a wireless remote for controls. The system is advertise to work with 3rd Gen iPods or newer and from our testing we found the iPod touch and iPhone can not properly be controlled. The iPod is meant to be housed in a padded pouch inside the backpack which features a headphone extension cable that is rerouted through the backpack and down the right shoulder strap where a female headphone jack is provided. For the remote Burton has made a rubber housing located on the left should strap which makes the buttons accessible at all times. The wireless controller is removable and works as it should, providing the basic play/pause, skip forward/back, and volume up/down. This backpack has some pretty impressive storage for its size and with only two large sections which incorporate many unique storage compartments allow for nice organization of your laptop, gadgets and small gear. When packed to the brim the bag can be a little bulky and stiff but the heavily padded back and shoulder straps allow for a somewhat comfortable fit. This backpack is not intended to be worn while snowboarding and frankly because of the shape and lack of an extra cross strap we wouldn't recommend it. It seems more fitting that the backpack be used around town or on short trips when you want to easily control your iPod's music and need to carry your laptop and other gear. Snowmodo is our snow sport winter meet up at Lake Tahoe, with prizes, discounts, tons of fun snow activities, a party and GADGETS. If you can make it (and people are coming from TEXAS) please RSVP. I'll let you wear my hat (below).